Over the past few weeks, I have received quite a few e-mails about Ethernet cards, both wired and wireless, and more specifically, about Media Access Control (MAC) addresses. I think the main reason I’ve received so many questions about Ethernet cards and MAC addresses is people trying to secure their home wireless networks and their desire to use MAC address filtering. This type of filtering in wireless networks can be configured to allow or deny specific computers to use or attach to the wireless network, based on the MAC address. My first thought was to write an article just about MAC addresses and wireless Ethernet. After thinking about it I decided to expand on this and go over some specific information about Ethernet cards and communication. There are several ways of finding your Ethernet and communications protocol information. Many Ethernet card manufacturers have proprietary software that can reveal this information but they work differently depending on the manufacturer. So we will use the Windows 2000 and XP “ipconfig” utility since this is available in the majority of Windows Operating Systems. There are several ways of finding your Ethernet and communications protocol information. Many Ethernet card manufacturers have proprietary software that can reveal this information but they work differently depending on the manufacturer. 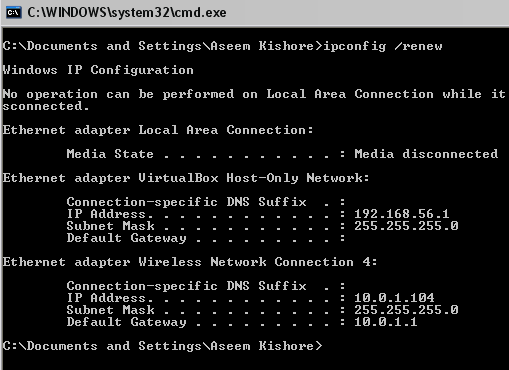 So we will use the Windows “ipconfig” utility since this is available in the majority of Windows Operating Systems. This is the name of your computer, typically defined during the windows installation. However, it can be changed after installation. If your computer participates in a network such as a Microsoft Windows domain this item may contain the name of the domain. The Node Type may say Unknown, or peer-to-peer, or in some cases “hybrid”. It is a setting that has to do with the Windows Internet Naming Services used in certain types of Windows domain networks. This setting determines if Windows XP or 2000 will function as an IP router. If you have two or more network cards you can setup your system to act as a router, forwarding communications requests from one network to another. Windows 2000 can be configured to do this in a pretty straight forward fashion; Windows XP will need a registry modification. WINS Proxy is another setting that is related to the “Node Type” we discussed earlier. It is normally not a required setting in a home or small office network or newer types of Microsoft Windows domains. If you have multiple Ethernet (network) cards in your systems, as I do in this laptop, you will have multiple listings. This one happens to be the second Ethernet card, an internal wireless Ethernet card. This is the description of the Ethernet card, usually the Name / Manufacturer and type of Ethernet card. In this case, it is a Broadcom wireless Ethernet card built into my laptop. And here we have the MAC address. The MAC address is a 48 bit hexadecimal code and is suppose to be a totally unique address. It is 48 bits because each number or letter in hexadecimal represents 8 bits. Hexadecimal numbers range from 0,1,2,3,4,5,6,7,8,9,A,B,C,D,E, F. There are 6 alpha-numeric codes hence 6*8=48(bits). The first 3 codes identify the manufacturer of the card and the remaining codes are used to create a unique number. Theoretically, there should never be a card with same MAC address on a local network. However, there are a few exceptions. There are software tools that allow you to change this code. In fact, this is a step some hackers take to attack other systems on a local network. I say local network because MAC addresses are not routable between network segments. By spoofing this address, you can impersonate another machine on the local network. Traffic that was bound for the intended target can be redirected to the hacker’s machine. This is the address you would also use to populate a MAC address, or physical address table when setting up your wireless access point to support MAC address filtering. DHCP, or the Dynamic Host Control Protocol, if enabled means your computers IP address is being provided by a DHCP server on you network. The DHCP server could be your wireless access point, cable/dsl router, cable modem, or a server on your network. Also, if a DHCP server is not enabled on your network, your computers Operating System will auto-generate a random IP address within a certain predefined range. This means you could network a group of systems together without having to manually assign the IP settings. This parameter provides you with your current IP address. The address listed above is what is called a “private” address. There are certain classes of IP addresses that have been set aside for private use. This means for your internal, local, or private network at home or office. These addresses are not, or should not, be routable on the Internet. The Internet routes what are called “valid” IP addresses. Your cable/dsl router or cable modem has a valid IP address assigned to its “external” network interface. The external interface may be your phone line or cable TV cable. The Subnet Mask is a special number, or in some sense, filter, that breaks down your IP address, in this case, private IP address, into certain groups. IP addresses and Subnet Masks can be a complicated matter and would take an entire article to go over. The default gateway, the IP addresses listed above, is the IP address of the device that will route your request, such as when you try to browse a website, to the Internet. It is a bit more complicated than that though as gateways or routers can route traffic to various different networks, even other private networks. At your home or small office, this gateway most likely is your cable/dsl modem or router. The DHCP server, remember we talked a little about this above, is the device that assigns your computer an IP address and other information. DHCP servers can assign all kinds of information such as; Default Gateway, Domain Name Servers (DNS), IP address, Subnet Mask, Time Server, and much more. DNS Servers are internal or external servers that resolve Fully Qualified Domain Names (FQDN), such as www.defendingthenet.com , to IP addresses. This is done because computers don’t actually transmit your requests using the domain name, they use the IP address assigned to the FQDN. For most home or small office users, the primary DNS server is the IP address of your cable/dsl router. Your cable/dsl router than queries an external DNS server on the Internet to perform the actual resolution of the FQDN to IP address. The address 192.168.0.49 is an internal private device on my network whereas the 64.105.197.58 is an external public Internet DNS server and is present just in case my router has trouble performing the DNS resolution tasks. This information tells you when your computer received its IP address and other information from a DHCP server. You will notice it says “Lease Obtained”, that is because most DHCP servers only lease the IP address to you from a pool of available address. For instance, your pool may be 192.168.1.1 through 192.168.1.50. So your DHCP server has 50 IP addresses to choose from when assigning your computer its IP address. When the IP address, assigned by the DHCP server, lease expires it will attempt to lease you the same or another IP address. This function can typically be changed on the DHCP server. For instance, on some fully functional DHCP servers, you can configure the Lease to never expire, or to expire within 1 day and so on. You will notice the IP addresses and to the right of them the MAC addresses. Without this information, without the MAC address, you would not be reading this article right now. MAC addresses are not routable like IP addresses. They work on your local or private network. However, devices on the Internet perform the same tasks. Routers and switches maintain a list of their peer devices MAC address just like your computers and devices on your home or office network. I mentioned above that MAC addresses can be changed in order to redirect requests. For instance, if I were on your office network and you had an internal web server that took personal information as input, I could tell your computer to go to my laptop for the web site by broadcasting my MAC address tied to the real web servers IP address. I would do this when your computer asked “Who is the “Real Web Server””. I could set up a fake web server that looks just like the real thing and starts collecting information the real web server would normally collect. You can see how dangerous this can be. There are several other easy ways you can find your MAC address but they can be a little confusing if you have more than one internal network card. Most external USB, or PCMCIA wired and wireless Ethernet cards have their MAC address printed on them. In cases where the wired or wireless network card is inside your computer, such as in laptops, the MAC address is sometimes printed on the bottom of the laptop. Even Desktop systems cards that are inserted in PCI slots have the MAC address printed on the Ethernet card. Darren Miller is an Information Security Consultant with over seventeen years experience. He has written many technology & security articles, some of which have been published in nationally circulated magazines & periodicals. If you would like to contact Darren you can e-mail him at Darren.Miller@defendingthenet.com. If you would like to know more about computer security please visit us at http://www.defendingthenet.com.